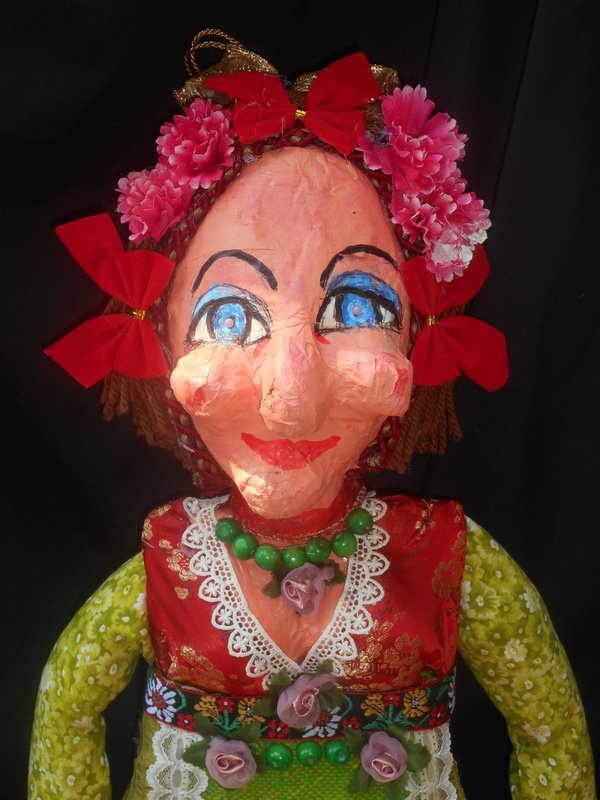 Cabaret Puppet Theatre is based in the beautiful Brisbane and Redlands area of south-east Queensland in Australia, performing for the young and young at heart. This includes Pre-School, lower and upper Primary School, Secondary School audiences and for adults of all ages in a range of different venues. 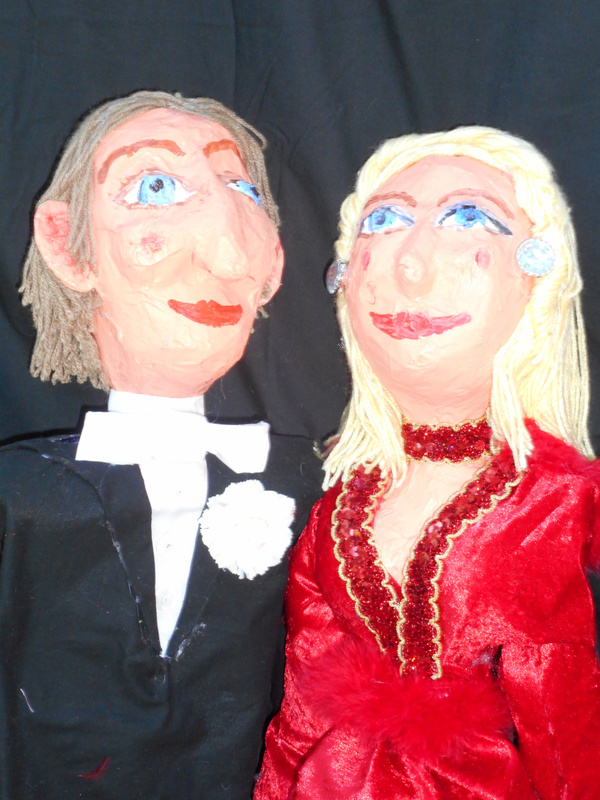 Cabaret Puppet Theatre also tours to regional areas by arrangement. Workshops in puppet design, making and performance are also available for young people and adults conducted by our Artistic Director and Principal Puppeteer. Our Artistic Director is a Registered Teacher with the Queensland College of Teachers and Queensland Government Blue Card Positive Exemption Card 252328/2 holder regulated by the Commission for Children and Young People and Child Guardian Act 2000. 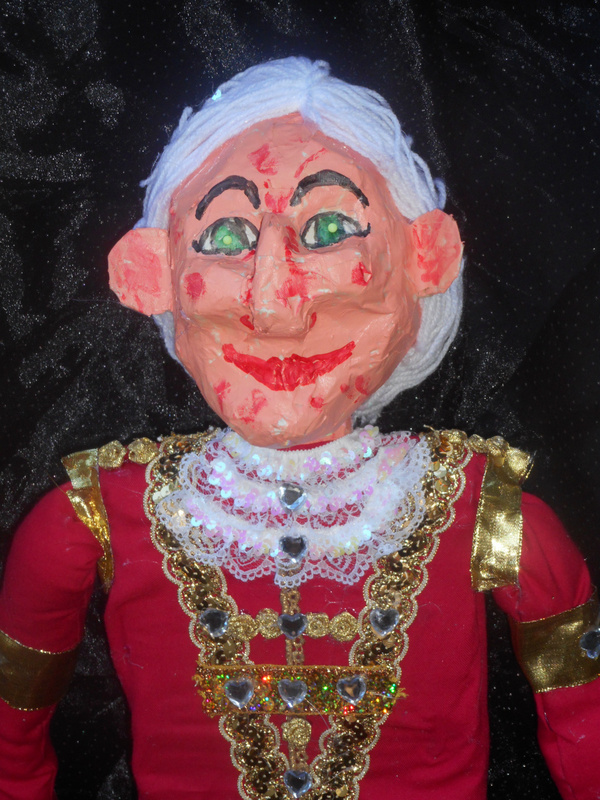 At Cabaret Puppet Theatre we love and care for the elderly members of our community out of respect for all that they have achieved and contributed in their long lives. They deserve joy in the lives. On the other hand, we love and care for the young because we are excited about their future and we want them to exuberantly fulfil their potential. 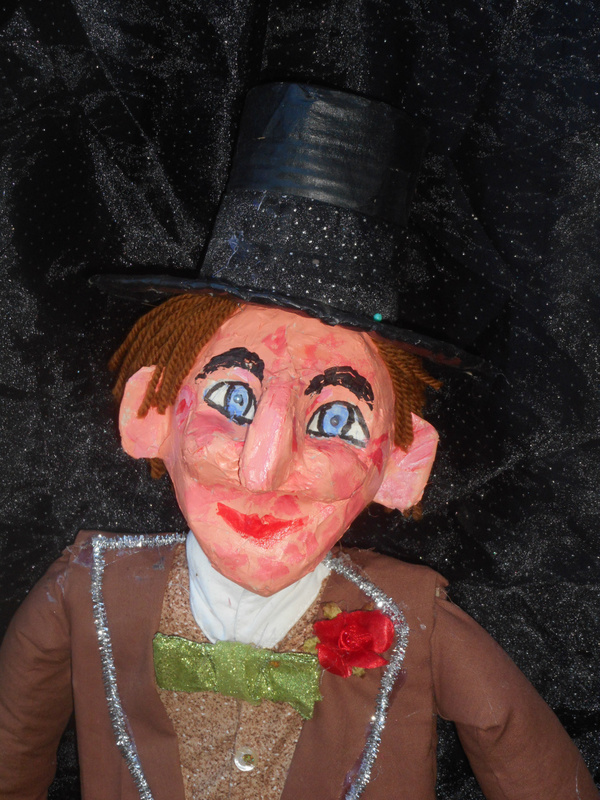 It should be noted that Cabaret Puppet Theatre receives no government funding and is a professional, privately operated theatre company devoted exclusively to puppetry. It has one of the largest collections of puppets in the southern hemisphere, all designed and made in Cabaret Puppet Theatre's workshop. Cabaret Puppet Theatre also possesses a quite unique and rather special collection of puppets obtained from many different countries all over the world. Please note all images on this website are Copyright 2017 - Cabaret Puppet Theatre. To book a show please go to the Contact Me section of the website. 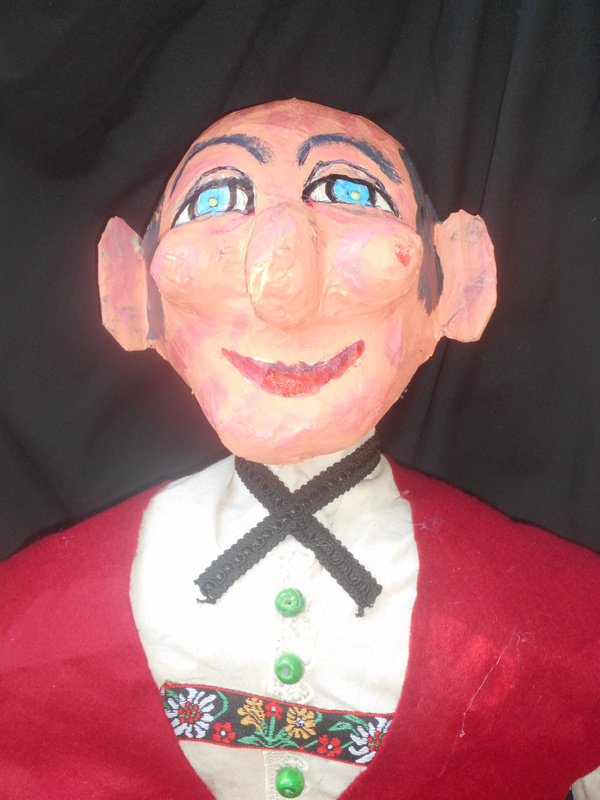 Cabaret Puppet Theatre has most gratefully received a wonderful collection of beautiful marionettes operated by the late gifted puppeteer, Philip Edmiston. It is a distinct privilege to save this collection. In time the collection will be digitally recorded. Today is 'World Puppetry Day', a special day to mark the many different types of puppetry. 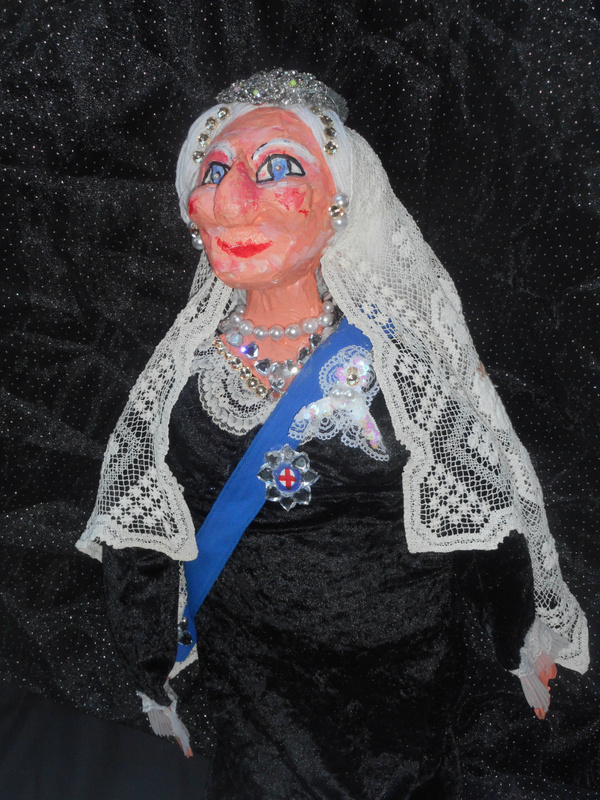 Cabaret Puppet Theatre celebrates this day by inviting all our visitors to look at over 170 of our puppets from a large range of different productions. Enjoy the experience! Yesterday's special tribute show to England and Ireland went off fabulously before a delighted and excited audience. Joining Toby the Tower of London Beefeater were Queen Elizabeth I, William Shakespeare, King James I and VI and a great many more! New puppet stars make their appearance! 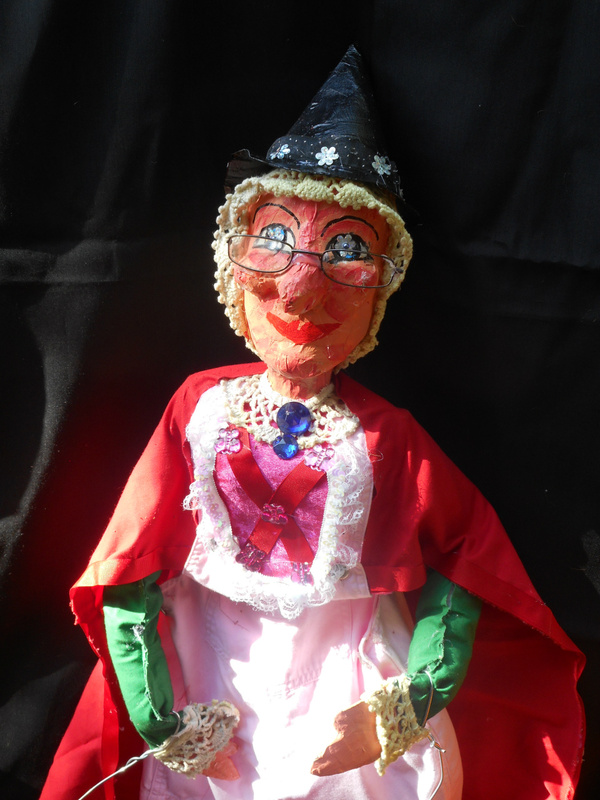 Some wonderful new puppets stars have recently been added to our fabulous Cabaret Puppet Theatre company! Why not check them out? They're on Page 4 of 'Our Cabaret Company'. 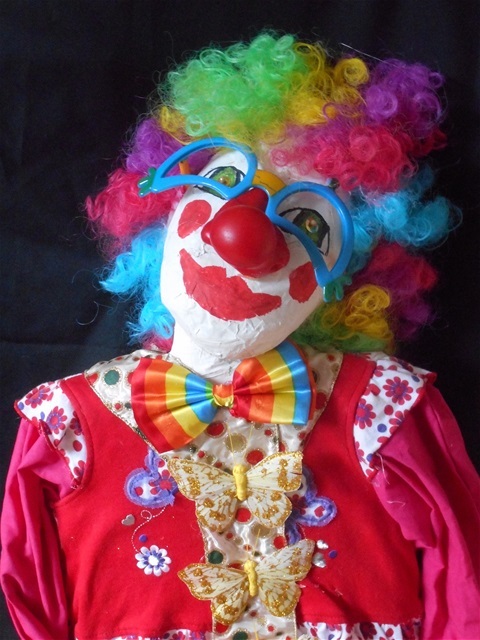 One of them is our most colourful Happy Clown, featured at the top of this page. At Cabaret Puppet Theatre we're proud to say our rather special puppet theatre is made up of over 170 different puppet stars with more to join our sparkling ensemble later this year! 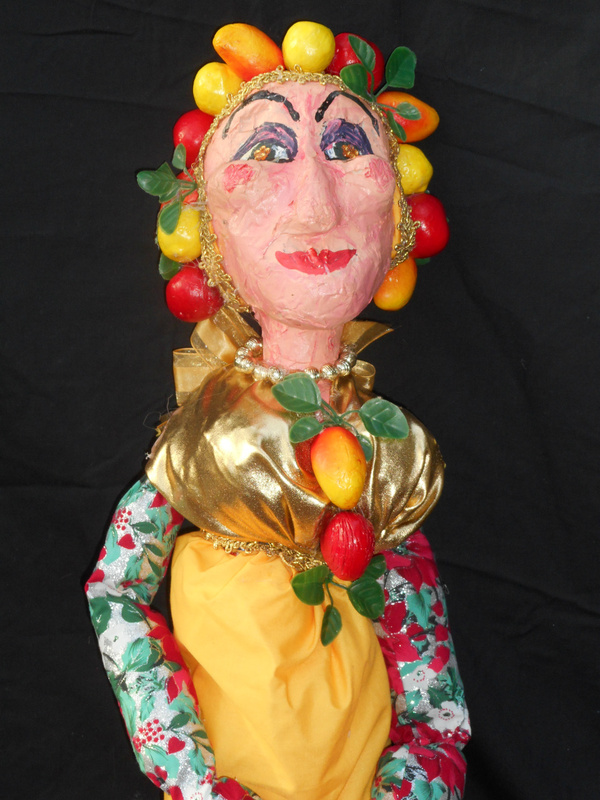 Some fabulous new puppets are currently being made for our next show, scheduled to take place on 6th March. Watch this space to await their unveiling! Australians let us all rejoice! Our special show, 'Salute to Australia' returns on 23rd January! Join Aussie Annie and Crocodile Charlie as they celebrate everything Australian! Find further details at the Young at Heart - Salute to Australia section of the website. To book a show use Contact Me. Our wonderful show, 'Oktoberfest' was once again lots of fun with Fritz the Barman and lovely Helga the barmaid celebrating as only they can. Polly Filler is our latest star! Miss Polly Filler can't wait to entertain! 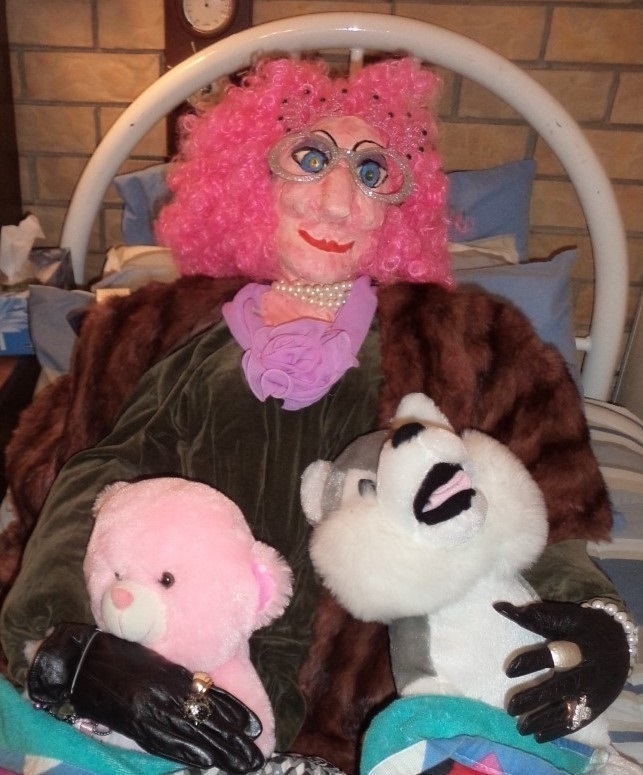 Cabaret Puppet Theatre's latest star, Miss Polly Filler can't wait to make her appearance in our next show in August. Leaving her luxurious Swiss mountain chalet, jetting in via her own private jet, Polly arrives courtesy of her limousine to share her unique views on life through her most whacky sense of humour and beauty products. Strictly for our older audiences. Expressions of interest are now open to attend Puppetry Making and Performing Workshops in January 2019 conducted by our Artistic Director. Spaces are strictly limited. Use the 'Contact Me' section to find out further details. Our one and only MC compered a special one off show entitled, 'It's a Small World' paying tribute to Italy, Greece and India featuring his friends, Poppa Luigi the madcap Italian Chef and his zany son, Beppo the Clown as well as the highly talented Nana Mouskouri and Rajiv and Indira, our Bollywood stars. Our special audience truly enjoyed a wonderfully sparkling show on Monday, 9th July. All the colour and fun of the circus is coming to Cabaret Puppet Theatre in June in our new show, CIRCUS CIRCUS! Join our Master of Ceremonies, Clowns, Performing Animals and famous entertainers under our special big top! Our wonderful show, 'Marlene and Friends' made a most welcome return on Monday. Full of fantastic cabaret songs made famous by the most incredible star, Marlene Dietrich, it thrilled our most appreciative audience. Our exciting colourful production for the young and young at heart, 'Peter Rabbit', premiered on Monday, 9th April. This beautiful new show is adapated from Beatrix Potter's wonderful story. Our audience thought it was simply fantastic. Bookings are now available. Today, 21st March 2018, marks 'World Puppet Day'. It is celebrated all around the world. 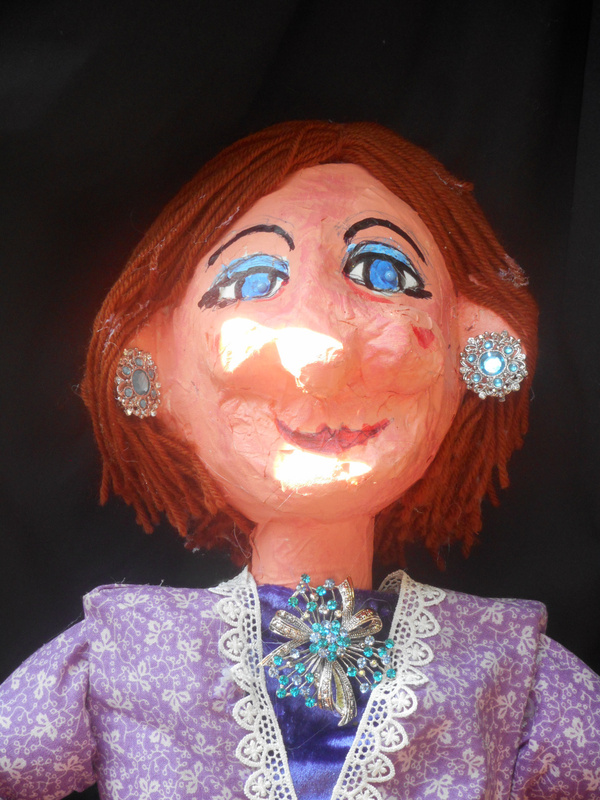 Cabaret Puppet Theatre is proud to be part of the wonderful world of puppetry that brings delight to the young and the young at heart no matter where they may be. Long may it all continue! 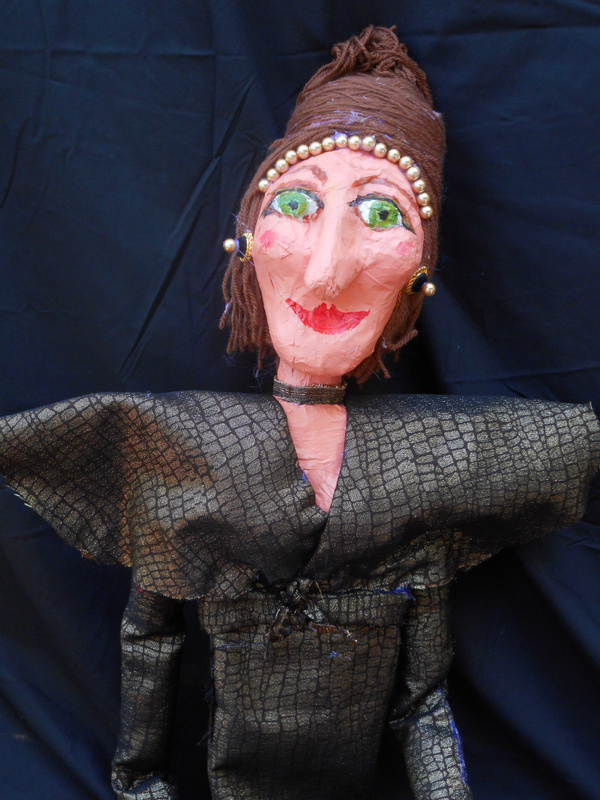 Twenty-two fabulous new puppets will feature in Cabaret Puppet Theatre's forthcoming show, 'Puppet Shakespeare'. It features famous characters, including the bard himself, from Macbeth, Hamlet, King Lear, Romeo and Juliet, The Tempest and A Midsummer Night's Dream. 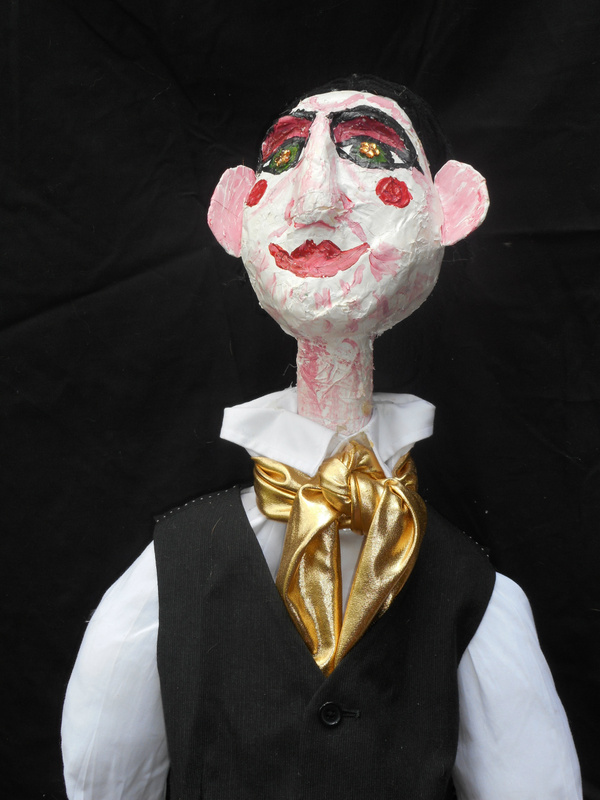 Why not pay a visit to our special 'Puppet Shakesepare' page and be tempted? Further news will be appear as the production becomes available for our audiences. It promises to be a thought provoking and most interesting show providing a taste of the very best of Shakespeare. Dinosaurs Alive! is an exciting forthcoming highly educational show for our younger audiences. Join world authority on dinosaurs, Professor Bone and his ever patient and fascinating secretary, Miss Maisie as they deal with exciting discoveries that stun the world. Further information and photos are now available. Mozart, Strauss and Lehar join us! Three of the greatest composers, the incorrigible Wolfgang Amadeus Mozart, the indomitable Waltz King, Johann Strauss II and operetta genius, Franz Lehar, present some of their most famous characters as part of our forthcoming production, 'Mozart and Friends'. Additional stars will soon be revealed. Today marks a special day for Cabaret Puppet Theatre with the unveiling of many new characters from our forthcoming show, Puppet Shakespeare! The great William Shakespeare, the renowned bard, is joined by many of his greatest characters from the plays, 'Hamlet', 'Macbeth', 'The Tempest', 'King Lear', Romeo and Juliet' and 'A Midsummer Night's Dream'. Other new characters will soon also be revealed. 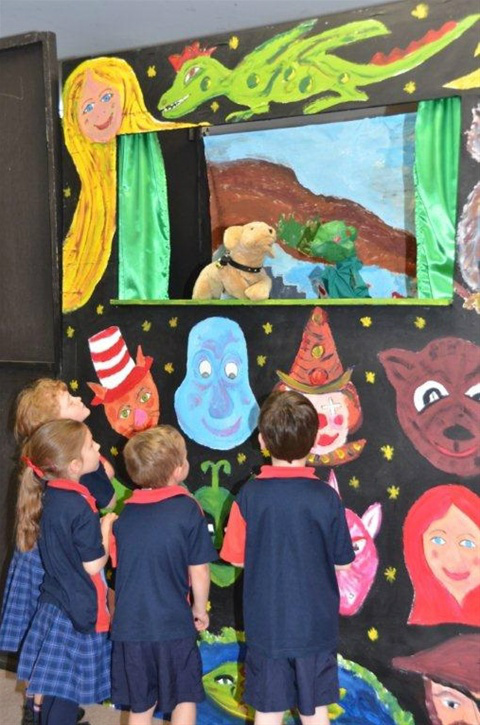 Cabaret Puppet Theatre recently presented a special salute to Australia to mark our national day. Our special audience thoroughly enjoyed the occasion. Cabaret Puppet Theatre enjoyed celebrating a wonderful Christmas full of goodwill and cheer. Our special show is over for another year. You can view and enjoy photos from our special Christmas show. It will be available once again from mid-November 2018. 'African Ways' and so much more! Cabaret Puppet Theatre presented a fantastic new show, 'African Ways', yesterday with many wonderful new puppet characters. Our special audience really enjoyed such an exotic Safari. Our next show is a special Christmas treat. In the meantime we continue to prepare for our forthcoming shows for 2018, 'Puppet Shakespeare' and 'Mozart and Friends'. Why not pay a visit to the individual pages to see characters from these shows? Photos will be added as these exciting new characters make their debut. Miss Polly Filler, star of our latest show! 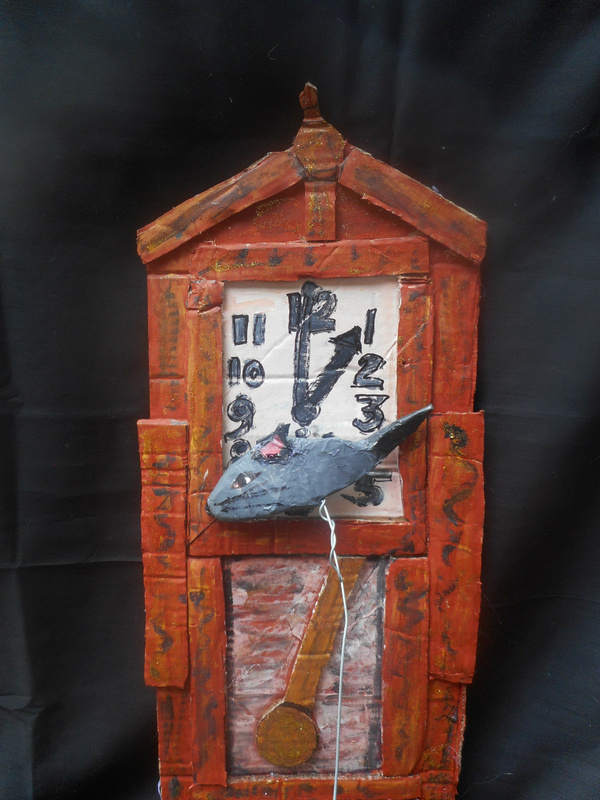 Expressions of interest in attending a two to three day special puppetry workshop run by our Artistic Director in mid to late January are now invited. This special workshop would entail making a puppet and learning how to to bring it to life through voice and manipulation. Students would work with our Artistic Director to put together a show for performance. Places are available for students aged 10 and above. Please use our 'Contact Me' form on our website to register interest. 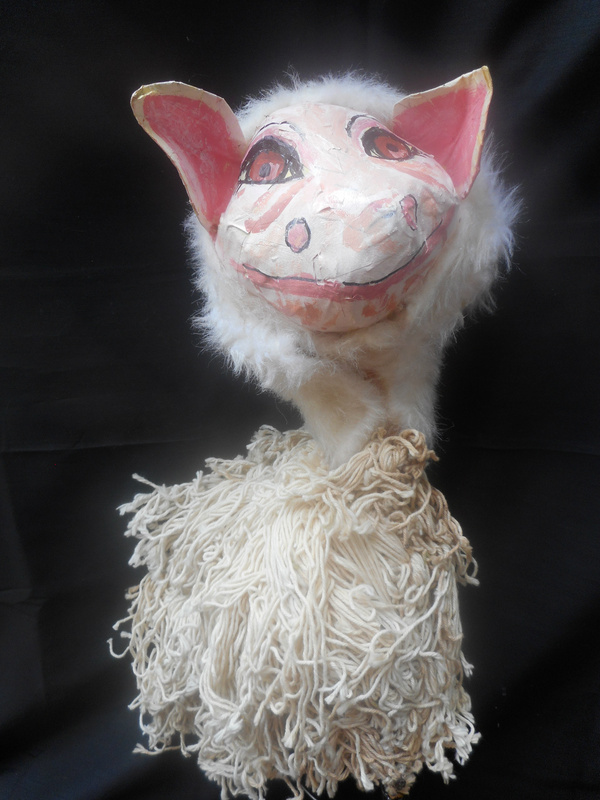 Cabaret Puppet Theatre is planning to add to its repertoire for 2018 with a new production especially designed for our primary school audiences entitled, 'Lots of Animals'. Join our intrepid explorer and adventurer Robert as he introduces a range of new, exciting and at times wild animals and birds! A special preview is now available! 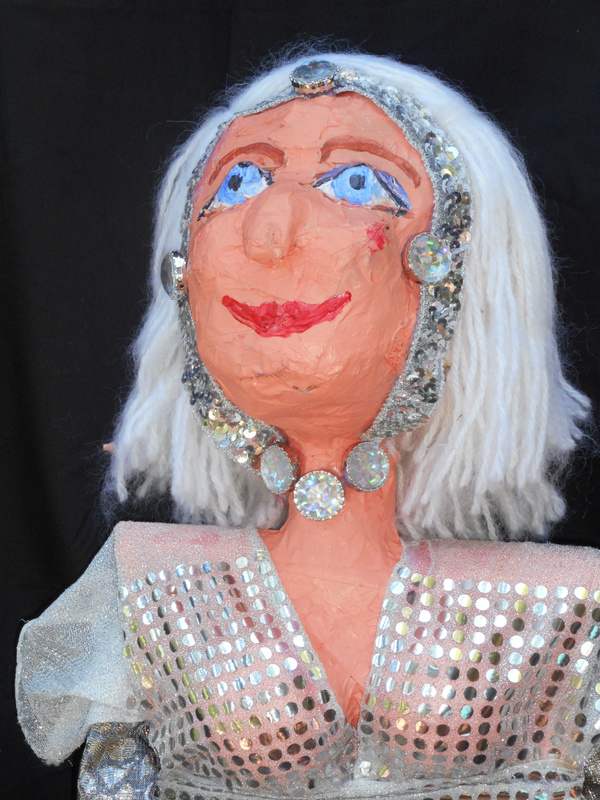 Cabaret Puppet Theatre presents a range of exciting shows for young people. For our Kindergarten and Pre-School audiences Mother Goose and her special Nursery Rhyme friends present 'Hey Diddle Diddle'. 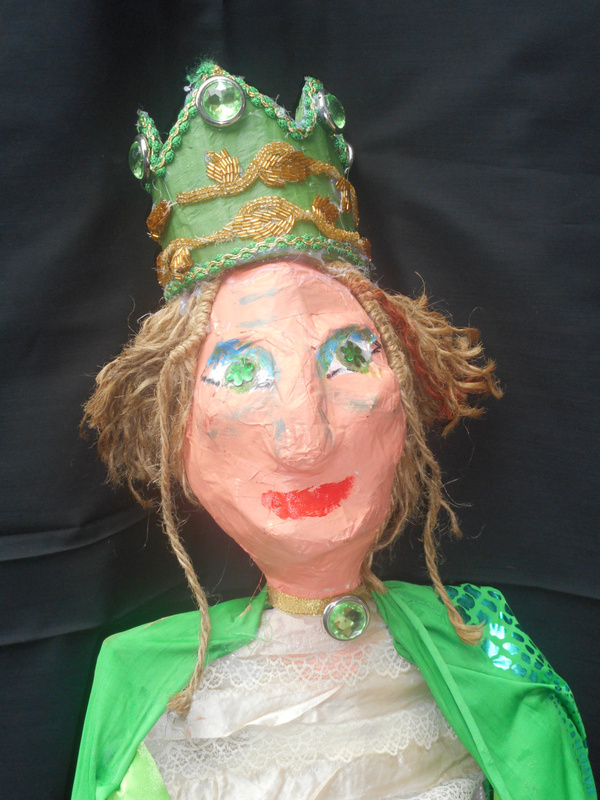 'The Frog Prince' joins our popular 'The Little Mermaid' for our lower and upper Primary audiences. Why not make a booking for one of our shows today? 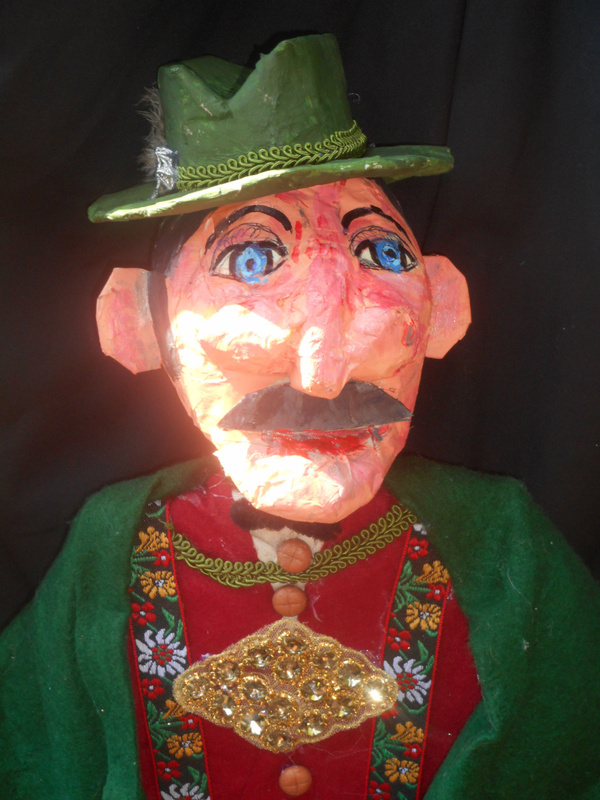 Some rather Germanic looking characters took to the stage at Cabaret Puppet Theatre yesterday to present their special show, 'Oktoberfest'. Barmen Fat Fritz and his long suffering wife, Helga the Barmaid almost brought the roof crashing down with all the laughter coming from the audience as they enjoyed specially brewed entertainment. Why not check them out at our special adult show section, 'Oktoberfest'? What a fabulous time our audience had at our special adult show, 'The Roaring Twenties'. The wonderful era of jazz certainly showed how much pleasure can be obtained from all the amazing work from that period of time. There was much laughter as well from the jokes from our famous clown. It was really an incredible experience! 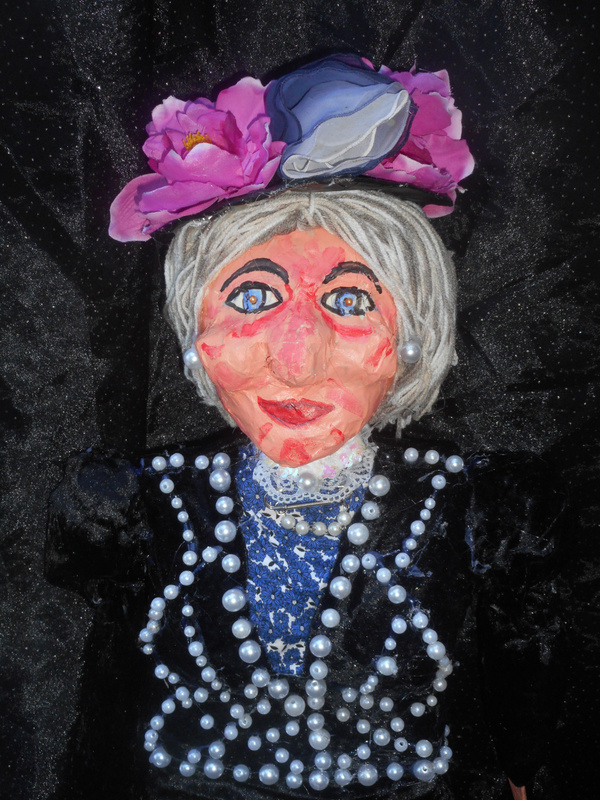 Cabaret Puppet Theatre presented yesterday a most sparkling production that paid tribute to all the colour, spectacle and fun of the Victorian Musical Hall. Glittering stars graced our stage bringing a great many special favourites to our audience. A cavalcade of spectacular new characters in their most superb finery and glittering jewellery provided wonderful entertainment. Our menfolk dusted off their top hats, white ties and tails to be most suitably turned out for the occasion. There were champagne corks popping with a lot of fizz, fizz, fizz as Champagne Charlie performed his famous song! Our beautiful divas were delightful down at the Old Bull and Bush along with our cockney Pearly King and Queen. Queen Victoria was most definitely highly amused by our most talented company. The most exotic Indira and Rajiv spiced up our latest show taking our wonderful audience on a most extraordinary journey about exciting India. Talk about Bollywood! Our recent adult show was a tribute to all things Italian! It was full of fun and laughter and even some operatic excerpts. Hosted by our larger than life MC and his sidekick, Poppa Luigi the Master Chef, our audience enjoyed themselves greatly. More famous stars joined us at our recent show including the delectable Screen Goddess, Marilyn Monroe, the most beautiful Nana Mouskouri and that South American incorrigible Carmen Miranda to name just a few joined us for adult cabaret. What a show, what an experience! There's never a dull moment at Cabaret Puppet Theatre! The legendary star of stage, film and cabaret, Marlene Dietrich, was the undoubted leader of a most glittering show for adults today. Our special audience were most certainly 'Falling in Love Again ... '! 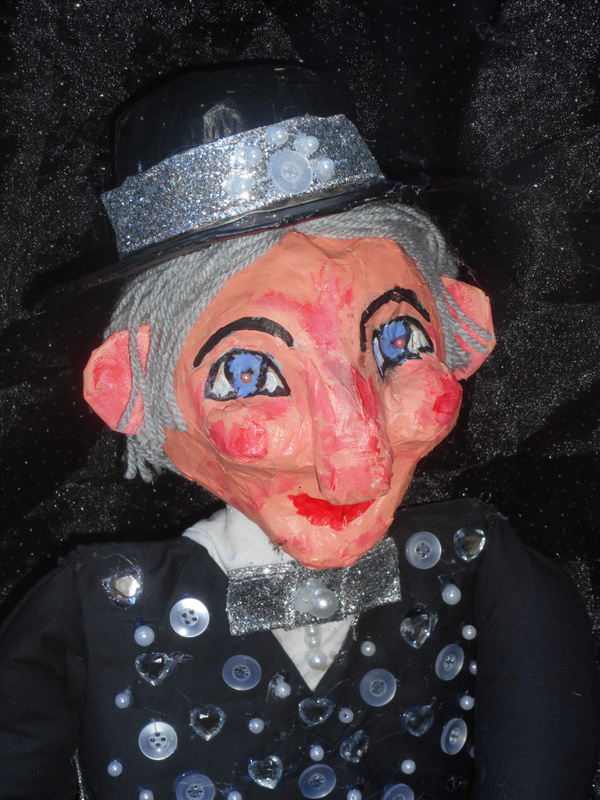 Cabaret Puppet Theatre staged a special Irish themed show for a most appreciative adult audience on 13th March. There was much fun and laughter as the jokes just kept coming thick and fast. Cabaret Puppet Theatre wishes all our friends and supporters worldwide a very Happy St. Patrick's day and all the luck of the Irish.